A couple of years ago I took the opportunity of visiting a command centre for launching Intercontinental Ballistic Missiles (ICBMs). 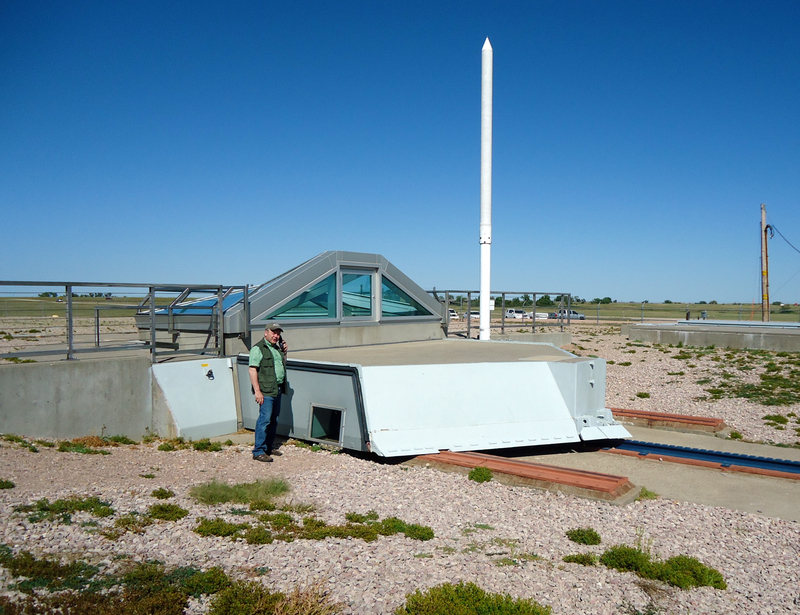 Margaret and I were touring around the legendary Wild West when we came across the Minuteman Missile National Historic Site, which is situated close to the Badlands national park. 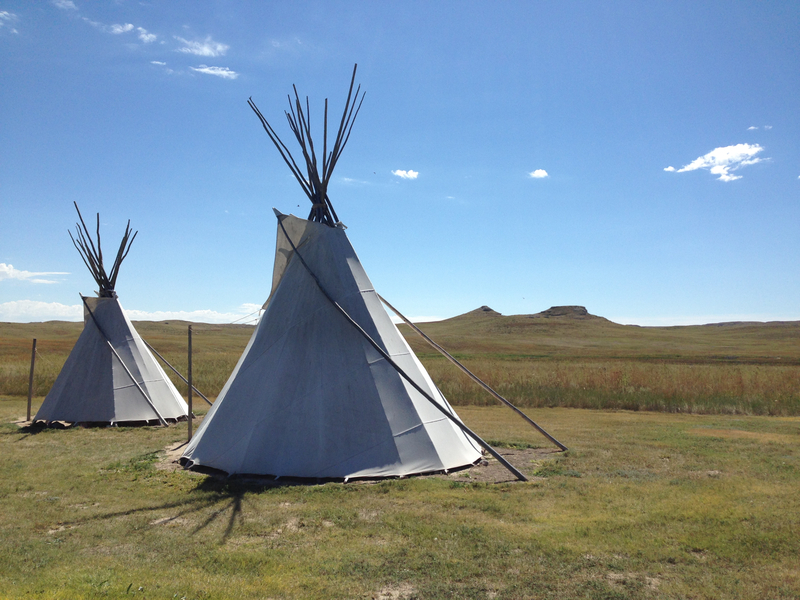 This vast empty grassland brought to mind pleasant scenes from the TV series “Little House on the Prairie” but the reality was more horrific when in 1890 the Ninth Cavalry had massacred up to 300 Lakota Sioux Indians at Wounded Knee Creek. I pondered over the fact that in the 1890s the Lakota Sioux had been virtually living in the Stone Age and then by 1960’s the Space Age had arrived on the Great Plains. Warfare had progressed from using primitive bows and arrows to using sophisticated ICBMs that could reach Moscow some 6,000 miles away in less than 30 minutes. I had first heard of ICBMs during the Cuban Missile Crisis of 1962. The crisis lasted two weeks and could so easily have resulted in a miscalculation or accident, which would have put all life on planet Earth at risk of extinction. 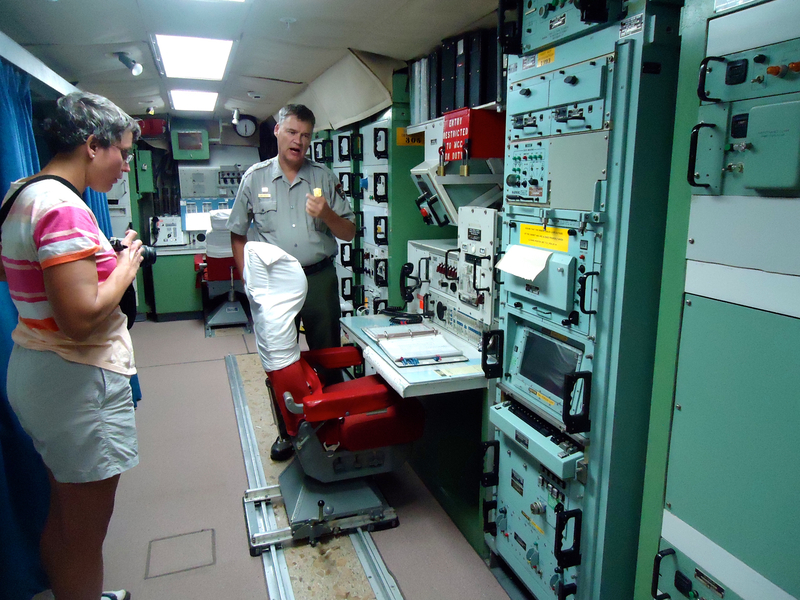 Minuteman II was operational between 1961 and 1991 at 15 command centers hidden beneath the grasslands. Each bunker had underground cables radiating outwards to control ten missile silos up to 10 miles away. Inside the sprawling visitor center we found lots of photographic displays and maps. In 1991 the Minuteman II network was decommissioned under the SALT2 agreement except for this installation in South Dakota and a Soviet equivalent. Sadly the prevailing ideology of Mutually Assured Destruction still lingers on with a new generation of ICBMs. We collected tickets for an underground tour then drove five miles along Interstate 90 to a command center that looked like an ordinary farm building except surrounded by a wire fence. A national park officer wearing a distinctive uniform and broad brimmed hat checked our tickets and led us into the Delta-01 building. This launch center had been operational 24 hours a day, seven days a week, for 365 days a year, for thirty years. There was a recreational area, an operations room and a security zone that remotely monitored each of the 15 missile silos. Any movement would have been instantly detected, even if a rabbit was hopping around, and then armed officers would have to jump into a jeep and visit the relevant silo up to 15 miles away. Our guide said the work of servicemen consisted of hours of boredom punctuated by seconds of panic. The security personnel had separate lives on the surface to those of the missile operatives who were always underground. I asked why there were padlocks on the fridge doors and was told this was to prevent their food from ever being poisoned. Our guide led us into a lift that descended about 40 feet in a concrete shaft to reach the launch control center. The inner bunker appeared to be shaped like a gigantic egg with concrete walls about five-feet thick and reinforced with two-inch diameter steel bars. A thick steel door was partially open for us to step inside the bunker that was resting on several huge springs intended to absorb any violent earth movements if a Soviet nuke had ever landed nearby. Two armed servicemen would once have been seated 12-feet apart awaiting the order that fortunately never came for them to simultaneously turn their launch keys; thus triggering the end of the world, as we know it. If one of the missile operators went mad his companion was supposed to shoot him. If one of them had a twinge of conscience and decided to break off a pencil in the slot to stop the key from being inserted, his colleague was authorized to break open four seals so that the twin key system could be over-ridden. There was copper shielding around the hardwired cables for protection against electromagnetic fields. After launch, the missile operators would have had enough food, water and fresh air to stay in their bunker for seven days. Our guide pointed out an emergency escape route that would involve climbing a ladder. However, he admitted that if a Soviet nuke had landed nearby the hatch would have been impossible to open and if they did reach the surface they wouldn’t have lasted long due to high levels of radiation. Finally we drove 15 miles West along Interstate 90 to reach Delta-09. This was the last remaining Minuteman II missile silo and was inevitable surrounded by a security fence. We peered through a thick glass lid but all we could see was the pointed nose cone and then what looked like a deep shaft enveloped in darkness. Just to one side was a thick slab of reinforced concrete that would provide protection until being slid away a few moments before launch. 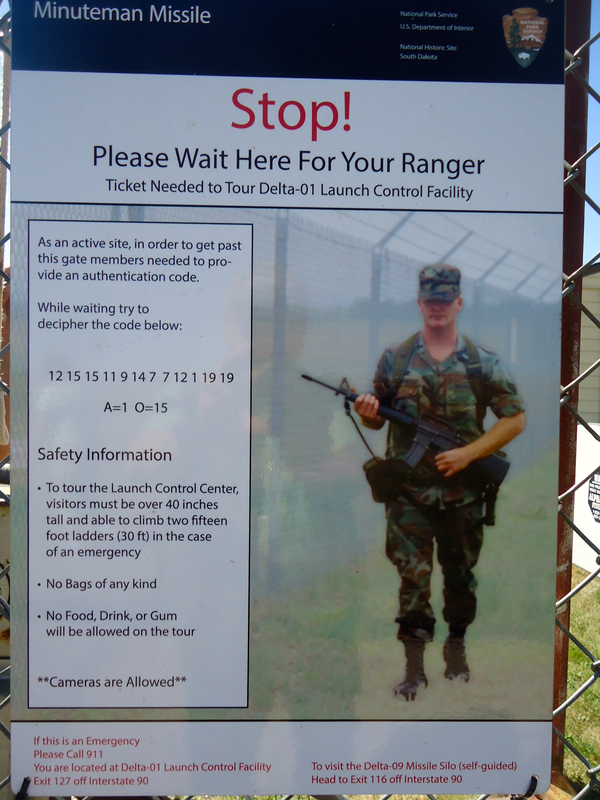 By this stage we had spent half a day wandering around the visitor center, Delta-01 command center and now Delta-09 missile silo. The sunshine was blazing down and we were ready to find a cool place for lunch. The experience had given us plenty to think about. 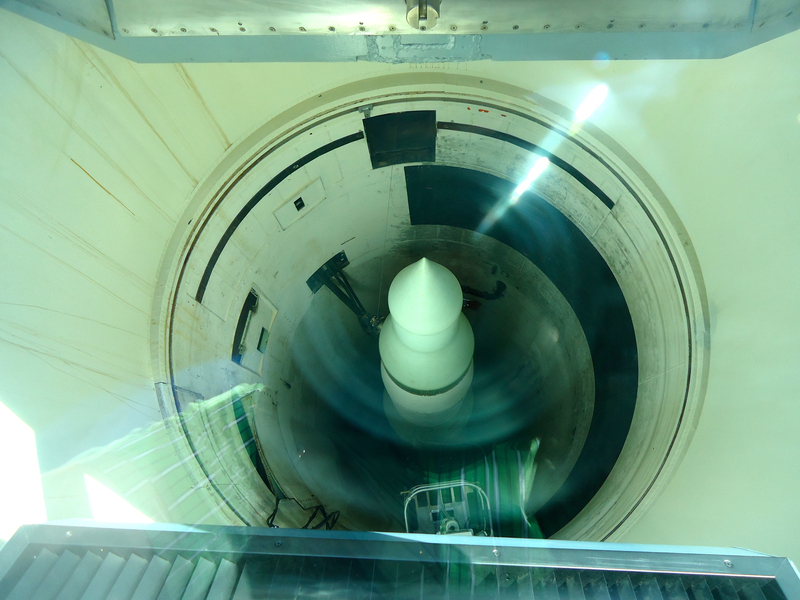 Those who had worked at the Minuteman II command centre and the ten silos must have really believed in the necessity of nuclear deterrence or else they would not have been able to continue with all the routine checks and endless practice sessions. It struck me that there was so much potential for things to go wrong during the Cold War (1947 – 91) that surely God must have inspired and answered the prayers of countless people around the world for the prevention of nuclear war. The US expenditure on deterrence must have been astronomical but the best that can be said is that these weapons of mass destruction were never fired in anger. Minuteman II had been decommissioned in 1991 but I was left wondering what new and more deadly technology had replaced it? By now the world would be a better place if even a fraction of US military expenditure could have been diverted into relieving poverty, providing health care, education and employment. The same goes today for UK expenditure on replacing Trident. Now I am praying more passionately than ever: “Thy kingdom come and Thy will be done on Earth as in heaven.” Can you imagine nukes in heaven? If not, then ultimately, they have no place on Earth! Contributed by Arthur Champion who serves as a vicar in the Cotswolds. 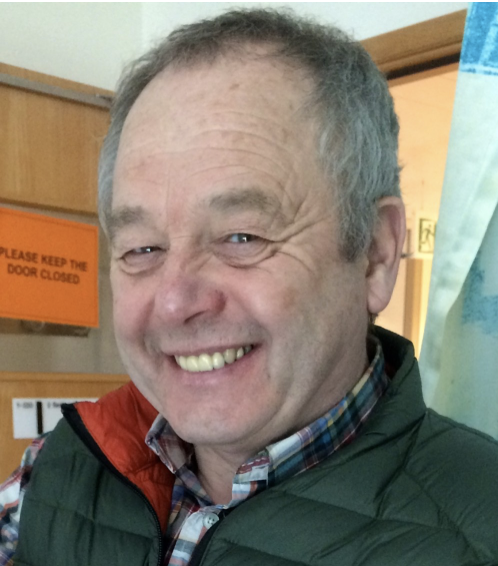 Previously he was employed for 30 years as health, safety and environmental manager for a multinational insurance company. He is a member of Christian CND.